Advertiser.ie - Enda the line? 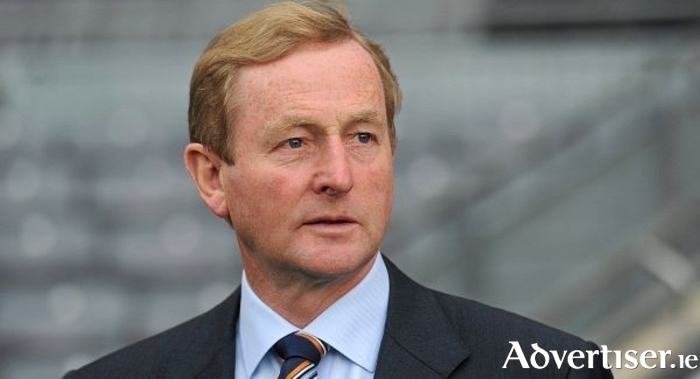 Taoiseach Enda Kenny is facing a crucial few days that will decide when he will announce the date when he will step down a leader of Fine Gael. The Castlebar-based TD is set to face a leadership challenge from his own ranks if he does not give a firm indication by early next week of when he intends to step down from his position. It is believed that he has been given a matter of days to choose a date that will placate party colleagues dismayed by his performance during the past week. Mr Kenny has faced a very tough week with the fall out from the Maurice McCabe affair dominating the headlines and leaving his leadership of his party and the country as the number one topic of discussion around the nation. The signals coming from within his own party is that the Taoiseach will face a leadership challenge from his own ranks if he does not give a firm indication of when he intends to step down from his position. With both Minister Leo Varadker and Minister Simon Coveney reported to have told members of the Fine Gael parliamentary party at their parliamentary party meeting this week that the party needed to be ready for a general election, it has been seen as the firmest indicator yet that the two leading contenders to replace him in the leadership of the party are ready to see change sooner than later. The Taoiseach has said that he will not lead Fine Gael into the next election, but with the possibility of a snap election being called if the independents who form part of the Government and Fianna Fail trigger it, his party colleagues don't want to be caught short. The Taoiseach, has faced lots of criticism this week for his handling of the Garda whistleblower controversy, which is reported to have almost brought the current coalition government he leads to collapse. The Government survived a vote of confidence on Wednesday night, following Fianna Fáil's agreement to abstain from the vote and maintain its confidence and supply agreement with the Government, that agreement coming not long before the vote was held. Mr Kenny has been the leader of Fine Gael since June 2002, when he succeeded the current Minister of Finance, Michael Noonan. He has led his party into three general elections, in 2007 where they picked up 51 seats an increase of 19 seats on their previous election. His most successful day as party leader was the 2011 General Election where Fine Gael won 76 seats and increase of 25 from their 2007 result and he led them into government as part of a coalition with The Labour Party. However, the 2016 election (the anniversary of which is coming up in nine days time ) saw Fine Gael lose 26 seats. Although Kenny was re-elected as Taoiseach, it was heading up a minority Government that relied on the support of independents and a confidence and supply agreement with Fianna Fáil. In 2011, Kenny led Fine Gael to pick up four of the five seats in Mayo with both himself and Minister of State Michael Ring both breaking the quota on the first count, in last year's election the Taoiseach once again broke the quota on the first count and Minister of State Ring was not far behind him. However, both Michelle Mulherin and John O'Mahony lost their Daíl seats last year (with O'Mahony contesting the Galway-West constituency after Mayo was reduced to a four seater ).